Cannot add a custom entry on iPhone X and 4.0.3. 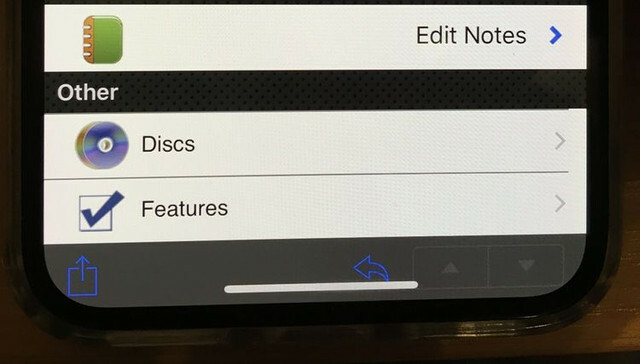 I cannot 'Save' or 'Cancel' when creating a Custom Entry as the buttons are overwritten by the notch icons. The app has to be killed since you cannot back out using cancel. With 4.0.3 I can't update my collection connecting to DVD Profiler for PC. The connection always breaks up. Am I the only one having this problem? The app is unusable. I've got this running on several apple devices (...a couple iPhone 6 plus, iPhone 8 plus and iPads). No issues at all performing a database update whether I'm doing so locally or over the Internet. I can perform a database update over the Internet (with some profiles missing), but locally it won't work. Reinstalling DVD Profiler, repairing the database, and restoring from an existing backup didn't help. I use an iPhone X with iOS 11.2.1. Last edited: by Jack T.
The problem persists with 4.0.4 and iOS 11.2.2. It won't work with my iPad Pro either. Just tried with 4.0.4 which claims: "In this version. we've corrected an issue that prevented addition of custom entries, and fixed some issues specific to iPhone X support". Still cannot add a custom entry as the 'Cancel' and 'Done' "buttons" are not clickable on the iPhone X... this is with iOS 11.2.2 (15C202) which was just released. Is anyone else finding these 4.0x builds particularly annoying on iOS 11? I've got an iPhone 6 Plus running iOS 11.2.5 now (...prior I was running iOS 8.4.1) and am finding all sorts of issues with DVD Profiler for iOS 4.04 which I sync with my local DVD Profiler 4.0.0 Build 1762. Time permitting over the next day or two I'll post back outlining the various issues I'm encountering, screenshots included.